With the coldest April since I can remember, the bees are struggling to get out. They need the temperature to be around 13 degrees before they fly and that means no nectar being brought in at a time when they are increasing in numbers. 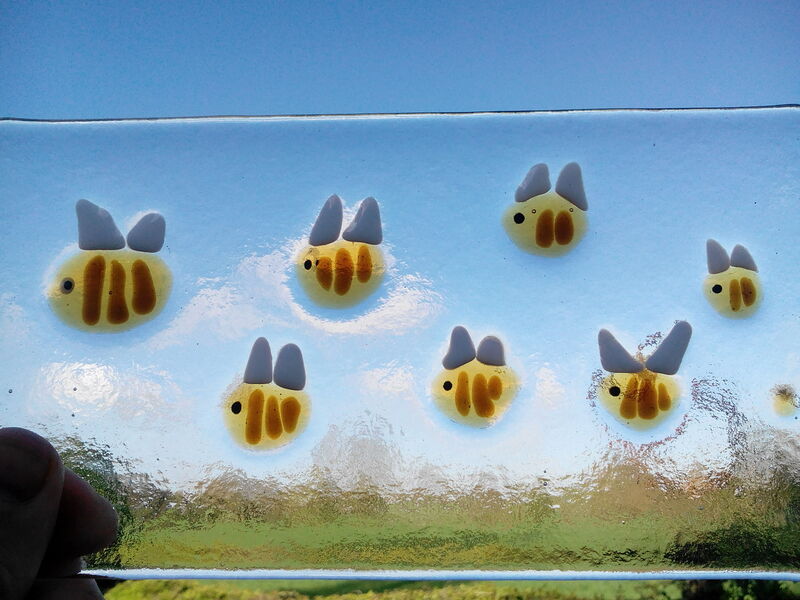 The trials and tribulations of a beekeeper aside, we have been making some glass bees ready for the Essex Young Farmer’s show, so at least there is the illusion of flying bees around here. 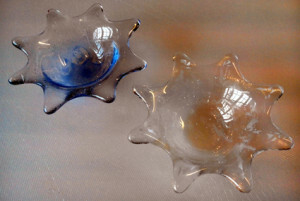 As mentioned in a couple of earlier posts, I have been playing with glass casting as an extension of fused glass work. I was inspired by a walk along a wonderful beach in Noordhoek, South Africa. The beach is simply huge, with wide expanses of sand. The wind can be low and harsh, making it feel like your feet and shins are being exfoliated. Anyway, whilst walking along the pristine sand I was hit by the ‘leave only footprints’ saying, and that gave me the idea for my first glass casting. Much research later and I was ready to have a go. What I wanted to produce was a glass foot with a small surround, as if I had poured the glass into the footprint in the sand. This makes life a little more difficult, as it meant that I needed to go through 3 stages to get the final kiln mould. 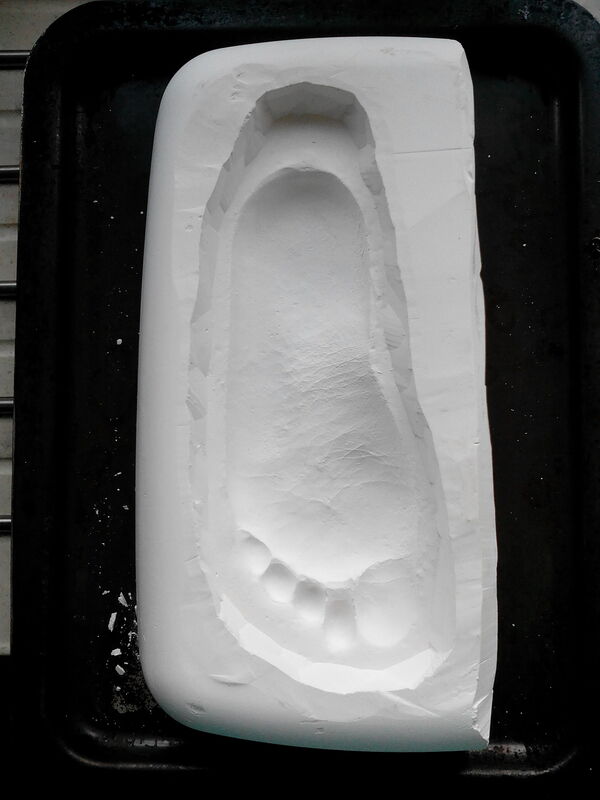 Stage 1 involves making an impression, in alginate, of a foot. My version of the sand footprint. For this my wife ‘volunteered’. 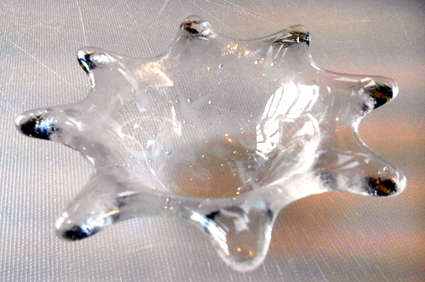 Alginate goes off in a matter of minutes so you need to work quickly. 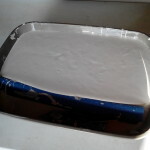 It is mixed from powder and put into a tray. add the required foot, wait 5 minutes and carefully remove. The result is a perfect impression. Stage 2 is to pour wax into the alginate impression to produce a ‘positive’ wax version of the foot. This was then trimmed to replicate what I want the final glass artwork to look like. 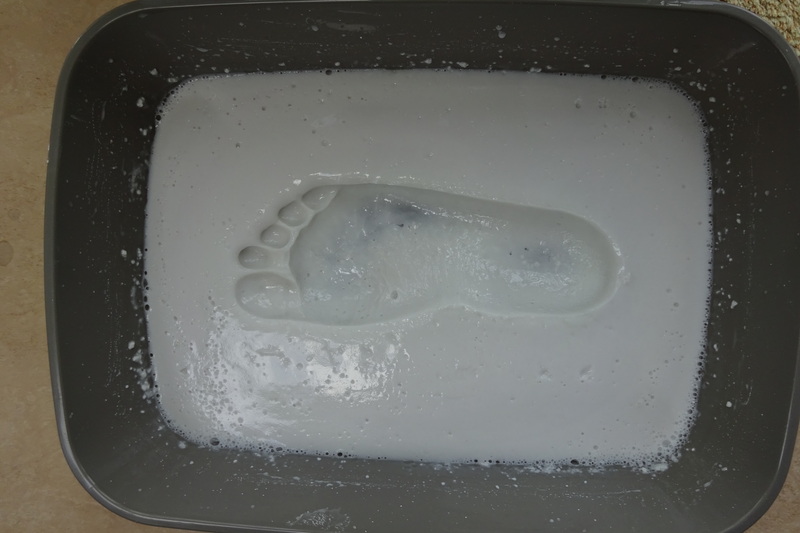 I managed to make 2 wax impressions before the alginate disintegrated. But from here on it is all one use, so no mistakes allowed. Stage 3 is to produce the final plaster mould. For this I am grateful to the selfless people who share their experiences on YouTube, particularly Di Tocker, whose videos I have found extremely useful and informative. Having sourced silica flour and plaster (much cheaper than the ready mixed packs available), I was ready. 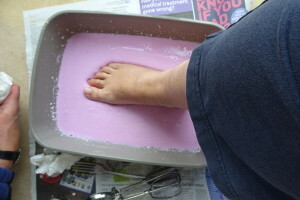 The wax foot is placed in a tray. The foam is just to reduce the amount of plaster needed. Mix equal amounts of water, silica flour and plaster. Pour over and there we have it. I also added a sheet of wire mesh into the top layer of plaster to add strength. Leave to set for about a day. 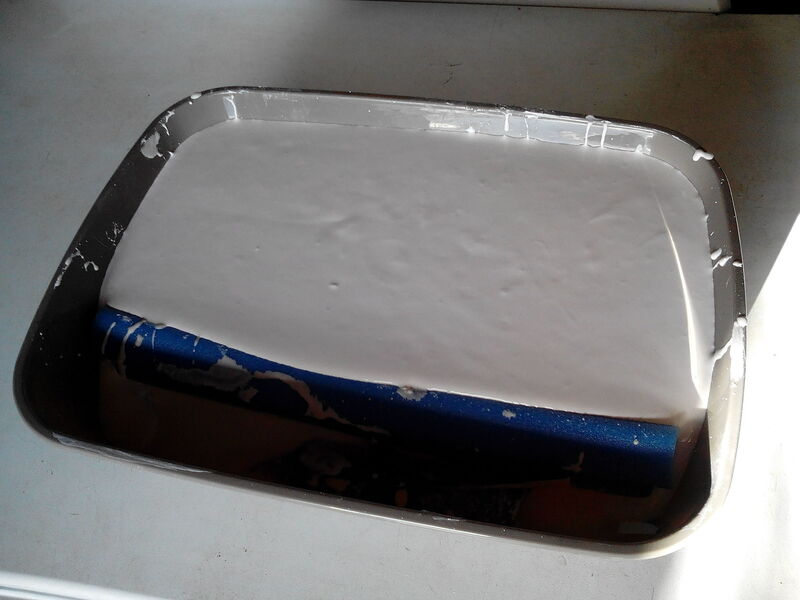 With the mould turned out of the tray, and 2 days in the bottom oven of the aga to melt out the wax and dry the mould, at last I have my final mould ready for the glass. That’s where I leave this stage. I need to do some more research on kiln programmes, as the annealing stages appear particularly sensitive on large cast items. I must get it right. 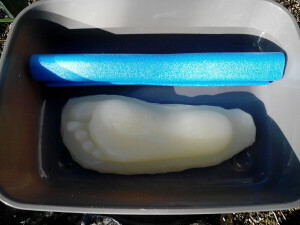 This is a one use mould, so no second attempts. Postscript: initial research suggests that I will need to run a 4 day programme, rather than the usual overnight, to prevent stress cracking. This is going to be expensive, so I might try to make a couple of extra small moulds up first to make best use of kiln space and cost. Thanks to advice from IdealCreativity, and a little extra experimentation, my glass slumping problem is solved. Slowing the temperature ramp by half and increasing the temperature a little (from my own extra trials) and I have perfectly slumped tea light holders. I have run this programme twice now to make sure it was repeatable and they came out identical. Thanks Kristin. Last December I marked my anniversary of ‘signing on the dotted line’, to leave work, after more than 33 years at e2v. Today, 7th April, is the first anniversary of my actual leaving day. It therefore warrants a retrospective thought or two on my gap year(s)/retirement/change of direction. So, ‘change of direction’ is closest, but also perhaps the wooliest. Come back next year (or before, please), to see if I have settled on a description I am truly happy with. Or perhaps it doesn’t really matter. In the same way as I didn’t set rules or boundaries (or even a description) for my ‘change of direction’, I also didn’t set specific goals or objectives. That was my corporate world. Having said that, it doesn’t mean I don’t make lists of things to do. I like lists. Breaking rule no 1, I did set a simple goal to make sure that every day we were at home something on our plate came from the garden. It could range from frozen fruit for breakfast in the middle of winter, to a full meal when the garden is at its most productive. This we have succeeded in achieving. This year coming there will be more veg than ever. A year on, I am told I am not yet fully house trained. I still have a habit of ‘disappearing’ good cooking bowls for use in various non-cooking related activities. However, no cooking utensils have been harmed in the making of any items this year (at least none that have since been discovered). Whilst I have read 20 or so books in the last year, these have been in snatched moments. What I haven’t yet learnt how to do is sit down and properly relax. It really isn’t in my nature and I am not sure it ever will be. I can live with that. What is in my nature is to learn new practical crafts and skills, especially those on the ‘danger list’. This year has been no different it that respect, particularly with hot glass work. What I have become is a Radio 4 listener. Previously, I only really saw the radio as a source of music to accompany driving. Johnny Walker on a Sunday afternoon is also not to be missed as an accompaniment to making Sunday dinner. Now the radio has become a source of interesting informative programmes (and some great comedies) on Radio 4. Dare I say it, I am now an Archers fan and I say Rob deserved all he got. So here I am. A year on and perfectly happy, in fact more than that. Without a doubt it was the right decision for me to leave e2v. Adjusting to a life outside of the corporate world has been surprisingly smooth. That doesn’t make the previous 33 years I worked there anything but rewarding, exciting and developing of me as a person. I continue to be in contact with friends there (see you for lunch next week) and I wish them and e2v every success for the future. In my talks I have, and will continue, to hold e2v up as an example of UK manufacturing at its best and a great place to start out, through their excellent apprenticeships. Yesterday I took another look at the wonderful memory book given to me on my leaving day. It means such a lot to me. The effort that went into putting it together, gathering and collating thoughts from my e2v friends and colleagues around the world, was to me very touching and it continues to be treasured. Thank you. In finishing this post I come naturally to the unfailing support from my wife, from making the decision to leave, to everything we have done together over the past year. We now have even more time to learn new crafts together, next week are going to ‘Flame Off‘ to learn more about hot glass. I am feeling a need for a natty way to finish this post, an appropriate sound bite, a witty sign off. Sorry, can’t think of one, too busy, have a metal bean frame to build and there’s a bronze statue with a broken foot awaiting attention, oh and a book to read if I get the chance. Come back soon, I’ll be here, and do say hello in the comments as you pass. 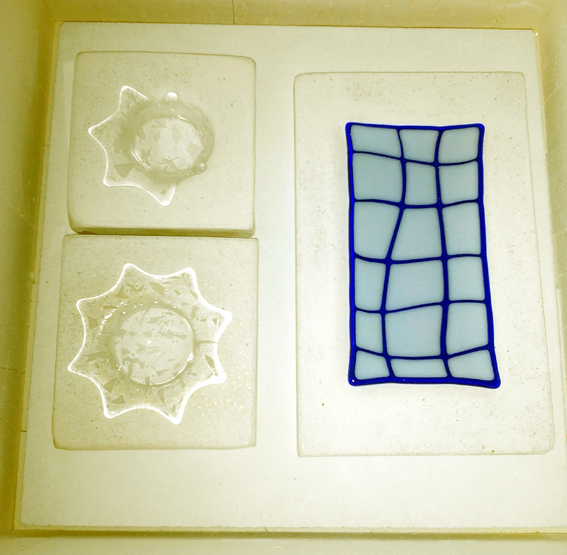 Following on from a fusing run, I slumped the results to make a shallow dish and 2 tea light holders. The dish slumped perfectly, which is not a great surprise, since it is a shallow run and so has nowhere to go other than into the mould. I think we have perfected this design now. The key setting was 725 degrees for 30 minutes, which I have adjusted following a few earlier slumping runs to the point where I have a setting that appears to make good shallow dishes and deeper slumping for tea lights. However, next we move on to a problem with the slumping of the tea light holders. The holder at the front of the kiln didn’t slump enough, it has a rounded base that didn’t reach the kiln floor. Worse was the tea light at the back, as can be seen in the detail pictures below, it slumped unevenly, sinking down unevenly on one side and not the other. I am a little mystified. 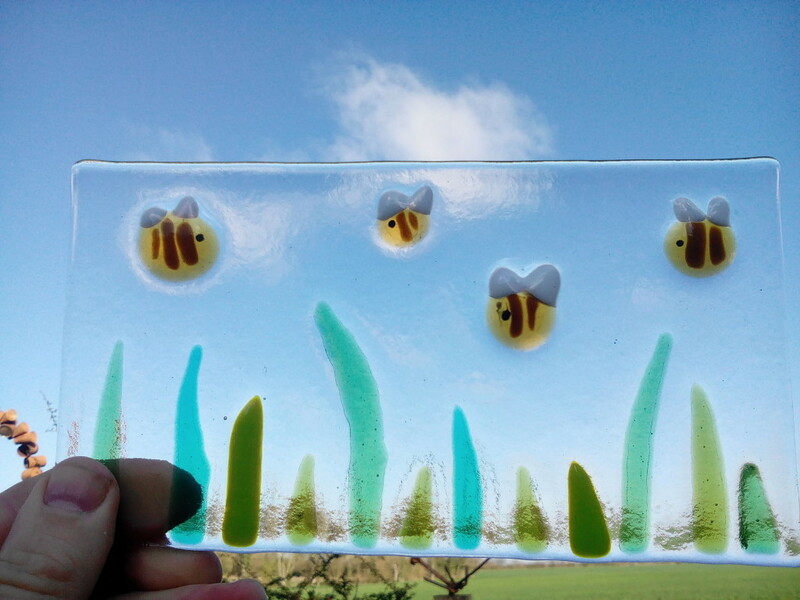 I have a few theories, against which I would welcome a critique from those more experienced in fused glass work. I have a Kilncare kiln, which is supposed to have (and on fusing runs has proved to have) a good even temperature across the kiln. But is the slumping process too sensitive to run successfully towards the corner. 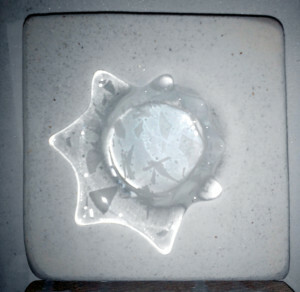 Does this explain why the inside of the top tea light has melted more? But, if this is the case then why has the bottom tea light slumped evenly, but not enough, suggesting that it wasn’t hot enough? Or could it be that my vermiculite mould is too rough to allow the glass to ‘slide’ down and has caught it on one side? I have checked and this doesn’t seem to be the case, unless again it is extremely sensitive. 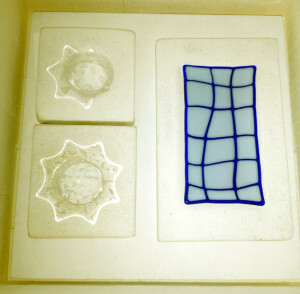 If this wasn’t the same setting that was successfully used for the last tea light, I would think that I need to increase the temperature by 5-10 degrees and move the tea lights to be more central in the kiln. Or am I missing something? Any ideas welcome.